Three reasons for this dish. First, the weather has been unseasonably cold these past few days. In my opinion, nothing warms up like a hot bowl of soup. Secondly, We just got a panini press. I just couldn’t resist having a soup and sandwich brunch. And lastly, because of a misinterpreted shopping list, we ended up with way too many tomatoes. I guess if life gives you tomatoes. You make tomato soup. I am a huge fan of Jamie Oliver. In many ways, Jamie reintroduced me to cooking. With his easy-going and humorous manner, this chef makes cooking uncomplicated, accessible and even fun. This dish is all about comfort. It’s simple and relatively quick to make. In a large pot, saute the onions, garlic and carrot and basil stalks in olive oil. Cover the pot and simmer gently for 20 minutes. Whisk the cream, vinegar and egg yolks together in a bowl and put aside. Drop the tomatoes into boiling water for 30 seconds. Then gently move them into an ice bath. Remove the skins and roughly chop the remaining flesh. Add the the chopped tomatoes to the sauteing vegetables. Add the stock and simmer again for another 20 minutes. Lid on, please. Return the pureed soup into the pot. Bring it back to a simmer and season to taste with sea salt and black pepper. Garnish with finely torn basil leaves and truffle oil. * You can subsitute this with canned tomatoes. ** Don’t reboil the soup after this point or you might end up with tomato flavored scrambled eggs. Some may find this soup a bit rich. I would suggest you serve it with some bread. It helps cut the acidity. I myself love this dish with a warm French baguette. Wow I'm inspired to cook myself a batch (and that would probably last me a week). It's starting to snow here. well more accurately, we had icky sleet today. I hear his new book "Cook With Jamie" is supposed to be really good. But, I'm a fan and his new book is definitely on my wish list. Take heart, wysgal. In a matter of days, you will be in milder weather of the tropics. This soup sounds just wonderful! Perfect with the chilly (for Manila) weather we've been having lately. I wish our weather was like this more often! Gives me reason to muck about the kitchen. I'm actually not a big fan of the cold. But, I just love making and eating soup. And mila, I so agree with you. Any excuse to put cheese and tomatoes together. Yum. i used to have a crush on jamie oliver -- he's got personality! 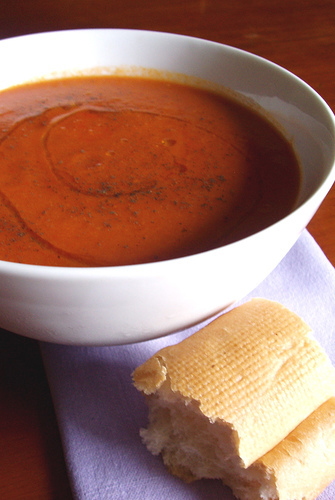 ;) this post reminds me of this tomato soup cooked by a 5yr old girl, as told by chef/author george germon. she heated butter in a pan, chopped tomatoes, cooked them in the butter for about 3 mins, added a bit of salt and cream. the chef said it tasted so good he was "absolutely floored." My greatest critics are always my nephew and nieces. The adults try to be kind but the kids pull no punches. For them it all about the good (or bad). It's simple and absolute.